-We all experienced updates with our upgrade to Windows 10 and Office 2016. There are settings in Windows 10 we are all figuring out and I hope the tips below will help you out. Windows 10 is profile based, meaning if I change settings for the lab computers, it will not be the same with your login in the computer lab. -Teachers that completed ITA or Intel have access to Apple TV. Remember... apps like Doodle Buddy and Show Me allow you to annotate over sheets you have taken a picture of and project over Apple TV. This is great if your document camera is still not working. Plus, it puts you in the POWERZONE! -With the implementation of STEAM, please hold off on reserving the iPad Cart. I hope to have a 3rd cart available for checkout soon! 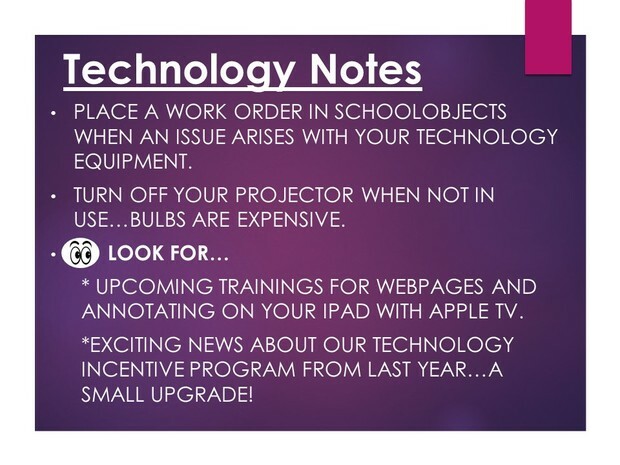 Refer to the "Technology Subscriptions" attachment sent via email on Friday, August 26th from CTIS.